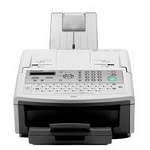 33.6 Kbps Super G3 Mid Volume Laser Facsimile - Perfect for small to midsize offices or workgroups that rely on facsimiles for their day-to-day operations, the UF-5500 series is the business-class fax solution promising reliable operation, an intuitive user interface, and a robust feature set. The UF-5500 features a high quality business class scanner that can scan documents in as little as 3 second per page. The robust print engine outputs crisp and clear letter-size documents at a blazing 24 pages per minute. This unmatched combination of high-speed scanning and printing will not only save your time but will increase office efficiency. 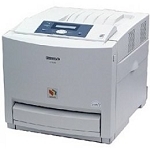 33.6 Kbps Super G3 Mid Volume Laser Facsimile - Built for true business-level faxing, the UF-6200 is equipped with a 50-page automatic document feeder, which can quickly scan documents at a rate of 2.8 seconds per page. With a touch of a button, multi-page documents are on their way and you are free to tackle more important tasks! With its high capacity 8MB document memory, the UF-6200can store up to 480 pages*1. That’s more than enough memory to easily handle several high-volume jobs at once. No wasted downtime! Panasonic DP-MC210D 21 ppm Desktop Color Multifunction Laser Copy Print Scan Fax with Duplex - The DP-MC210 is a high-performance desktop MFP that means business. With its 250-sheet multi-purpose tray and 2nd 520-sheet tray standard, this space-saving all-in-one solution has the capacity to handle big jobs, plusa 50-sheet ADF for scanning and copying multiple originals. Not only is the DP-MC210 network-ready with standard10/100 Base-TX connectivity, but it is also IPv6-ready for next-generation networks. The large 3.6-inch color LCD(TFT) display and intuitive control panel layout set a new standard in user-friendly operation, while having theability to monitor toner levels, edit the built in address book and adjust common user settings via the networkusing a browser, making device management a breeze. User Friendly Design improves efficiency and simplifiesmaintenance, as well as offering features like printing and scanning from the built-in SDHC card slot and standardduplex for easy 2-sided copies and prints. The DP-MC210 is the ideal solution for the small and medium-sizedoffice looking for maximum functionality, ease of use, and performance in a compact footprint. Panasonic DP-MC210P 21 ppm Desktop Color Multifunction Laser Copy Print Scan Fax - The DP-MC210 is a high-performance desktop MFP that means business. With its 250-sheet multi-purpose trayand 2nd 520-sheet tray standard, this space-saving all-in-one solution has the capacity to handle big jobs, plusa 50-sheet ADF for scanning and copying multiple originals. Not only is the DP-MC210 network-ready with standard10/100 Base-TX connectivity, but it is also IPv6-ready for next-generation networks. The large 3.6-inch color LCD(TFT) display and intuitive control panel layout set a new standard in user-friendly operation, while having theability to monitor toner levels, edit the built in address book and adjust common user settings via the networkusing a browser, making device management a breeze. User Friendly Design improves efficiency and simplifiesmaintenance, as well as offering features like printing and scanning from the built-in SDHC card slot and standardduplex for easy 2-sided copies and prints. The DP-MC210 is the ideal solution for the small and medium-sizedoffice looking for maximum functionality, ease of use, and performance in a compact footprint. 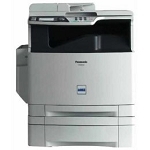 Panasonic DP-MC210S1 21 ppm Desktop Color Multifunction Laser Copy Print Scan Fax with Duplex & 520 Sheet Tray - The DP-MC210 is a high-performance desktop MFP that means business. With its 250-sheet multi-purpose trayand 2nd 520-sheet tray standard, this space-saving all-in-one solution has the capacity to handle big jobs, plusa 50-sheet ADF for scanning and copying multiple originals. Not only is the DP-MC210 network-ready with standard10/100 Base-TX connectivity, but it is also IPv6-ready for next-generation networks. The large 3.6-inch color LCD(TFT) display and intuitive control panel layout set a new standard in user-friendly operation, while having theability to monitor toner levels, edit the built in address book and adjust common user settings via the networkusing a browser, making device management a breeze. User Friendly Design improves efficiency and simplifiesmaintenance, as well as offering features like printing and scanning from the built-in SDHC card slot and standardduplex for easy 2-sided copies and prints. The DP-MC210 is the ideal solution for the small and medium-sizedoffice looking for maximum functionality, ease of use, and performance in a compact footprint. Panasonic UB-5338C 2 Panel Electronic Panaboard - The Panasonic UB-5338C Color Electronic Whiteboard is a color scanning system that allows the user to scan to USB flash drives or SD Memory Cards while maintaining the versatility of a conventional whiteboard. This color whiteboard scans in PDF and JPEG formats without the need for a driver on both Windows and Macintosh computers. Panasonic UB-5838C 2 Panel Electronic Color Panaboard - Panaboard UB-5838C color copyboard is a widescreen color scanning system that can transfer onscreen data directly to USB flash drives or an SD memory card. Panaboard UB-5838C comes with 2 interactive 76-inch panels. Save onscreen data in popular JPEG and PDF formats that are compatible on any mobile and computing platform. Use the included Panasonic Document Management System to organize information The plug-and-play technology eliminates the need for installing any additional software for operation. A thin and light form factor allows Panaboard UB-5838C to be mounted on any wall and transported conveniently. Built-in security features protect data from being accidentally erased or overwritten. Panaboard UB-5838C copyboard is packed with useful features that save time and allow presenters to focus on delivering quality content. A Clear Marker Reproduction Technology accurately scans blurred and jagged text and sharpens it for enhanced readability. It also refines rough diagrams and annotations by smoothing out jaggy edges. Panasonic KV-S1015C 20 ppm Color Sheetfed Scanner - The Panasonic KV-S1015C scanner is the quick and easy way to transform your paper documents to high-quality digital files,allowing you to manage, send or upload them to the cloud with just the touch of a button.Its compact design and intuitive operation make the KV-S1015C a perfect fit for small to medium size businesses, offering usersstraightforward set-up, innovative functionality and a host of advanced features. Like a cutting-edge paper feed mechanism equipped with Ultrasonic Double-Feed Detection and an ActiveDouble-Feed Prevention Roller System that ensures reliabledocument feeding at an impressive scan speed of up to 20 pages per minute.Bundled Presto! PageManager 9 software streamlines document management and filing, featuring the ability to convert documents to searchable PDF files while providing access to cloud-based services such as Evernote and Google Drive. Presto! BizCard 6 software helps you organize business cards, with the ability to extract contact data and export it effortlessly to major email clients or SalesForce via One-Click synchronization. Panasonic KV-S1015C3N 20 ppm Color Sheetfed Scanner with NEATS Software & 3 Business Cloud Subscription Bundle - The Panasonic KV-S1015C scanner is the quick and easy way to transform your paper documents to high-quality digital files,allowing you to manage, send or upload them to the cloud with just the touch of a button.Its compact design and intuitive operation make the KV-S1015C a perfect fit for small to medium size businesses, offering usersstraightforward set-up, innovative functionality and a host of advanced features. Like a cutting-edge paper feed mechanism equipped with Ultrasonic Double-Feed Detection and an ActiveDouble-Feed Prevention Roller System that ensures reliabledocument feeding at an impressive scan speed of up to 20 pages per minute.Bundled Presto! PageManager 9 software streamlines document management and filing, featuring the ability to convert documents to searchable PDF files while providing access to cloud-based services such as Evernote and Google Drive. Presto! BizCard 6 software helps you organize business cards, with the ability to extract contact data and export it effortlessly to major email clients or SalesForce via One-Click synchronization. Panasonic KV-S1015CNT 20 ppm Color Sheetfed Scanner with NEATS Software & 1 Business Cloud Subscription Bundle - The Panasonic KV-S1015C scanner is the quick and easy way to transform your paper documents to high-quality digital files,allowing you to manage, send or upload them to the cloud with just the touch of a button.Its compact design and intuitive operation make the KV-S1015C a perfect fit for small to medium size businesses, offering usersstraightforward set-up, innovative functionality and a host of advanced features. Like a cutting-edge paper feed mechanism equipped with Ultrasonic Double-Feed Detection and an ActiveDouble-Feed Prevention Roller System that ensures reliabledocument feeding at an impressive scan speed of up to 20 pages per minute.Bundled Presto! PageManager 9 software streamlines document management and filing, featuring the ability to convert documents to searchable PDF files while providing access to cloud-based services such as Evernote and Google Drive. Presto! BizCard 6 software helps you organize business cards, with the ability to extract contact data and export it effortlessly to major email clients or SalesForce via One-Click synchronization.